Love and hate—you’d never be able to understand what each word meant without the other. There wasn’t a fine line, they were one and the same, born from the other, and if I hadn’t hated her, if she hadn’t left, I don’t think we’d be standing next to each other today. 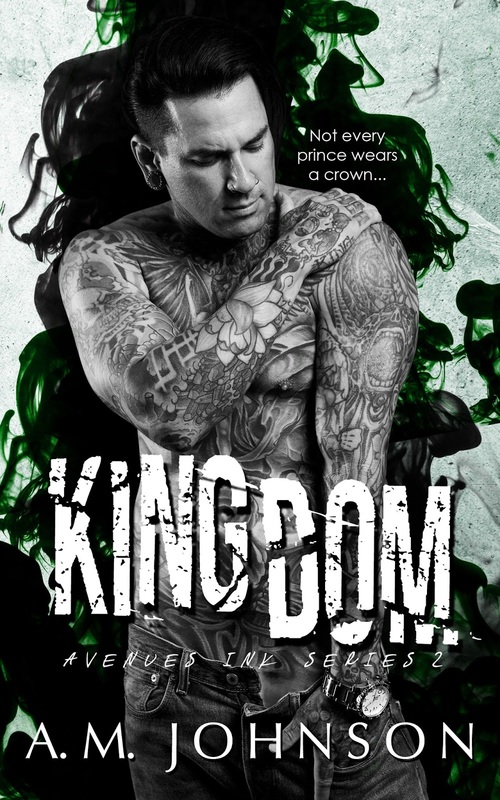 Two books in and author A.M. Johnson has yet to disappoint me with her Avenues Ink series. This is only my third read from her overall and each time, she puts my heart through the wringer, making sure that I don't just empathize with her characters of choice but that I truly feel for and with them. Told in the past and the present and in dual perspective, Kingdom is a story of second chances--of the kind of love between two people that can leave you empty with every nick and slash to your heart but also one that can fill those empty spaces and make you feel whole when the opportunity comes along and if you're prepared to risk it all again. It's also about family and how adversity may leave scars but how that love for and from a parent and your siblings can be the one thing that holds together those tattered pieces of your person and soul in order and how they, in turn, are your purpose. The eldest in a brood of three, thirty-year-old tattoo artist and studio owner Liam O'Connell takes his responsibility to his family and his business seriously. His hook-ups, not so much. It's been three years since his ex-girlfriend walked away from him and everything they had built together in order to follow her modeling dreams in Los Angeles. Liam remained in Utah, but Kelly took his heart with her, and anything that was left of Liam was reserved for his mother and two younger brothers. Then their paths cross once again in the hallways of a Utah hospital, one that has the mother he loves and the father she hates. She's still as beautiful as she was when she was seventeen and he was nineteen and when they first began to fall in love. But that love has been replaced by hate, and it's her face that haunts Liam. Her prince was gone, but could Kelly possibly awaken him once again or has all hope gone? Damn, but did this novel make me cry. I'm blaming it--and A.M. Johnson--for the cold I'm now suffering through. Liam and Kelly are damaged and imperfect, and God, they have their struggles, but how could I not root for them? How could I not want them to grab that second chance and have the kind of life that they deserved to have together? Johnson doesn't whip together shiny, happy characters who you want to be when you grow up. Nope, she gives us characters that have flaws and faults and at times, make you want to tear your hair out due to lots and lots of frustrating incidents. But those "negatives" are part of who they are, and it's the whole person--the entire character--that brings with them an air of familiarity. They have at least one thing that someone else can relate to, and at the end of the day, they redeem themselves and want to have and be better. Liam and Kelly were very real.